Konsul Hotel in Balti, all what comfort in Baltsy means. Feel yourself at home. A 3-star hotel that best fits an economic budget. The cosy, nice accommodation perfectly located, situated in the newest area of the capital. Welcome to the Gloria Hotel! Welcome to the Gloria Cottage! We are pleased to welcome you in our Econom rooms, where you will be nicely surprised by the style & beautiful design and the detailed work. We carefully designed our rooms for the comfort of the guests coming here for vacation, as well as for the guests coming in a business trip. Our Econom rooms are equipped with the following conveniences: TV satellite ( 500 channels ) DVD Mini-bar A double bed Snow-white linen bath set for personal hygiene Robe and slippers Towels set Hair dryer Phone line Wi-Fi access Central heating system All bathrooms are equipped with shower cabins with hydro-massage and music. We are pleased to welcome you in our Classic rooms, where you will be nicely surprised by the style & beautiful design and the detailed work. We carefully designed our rooms for the comfort of the guests coming here for vacation, as well as for the guests coming in a business trip. Our Classic rooms are equipped with the following conveniences: TV satellite ( 500 channels ) DVD Mini-bar Air- conditioner A double bed Snow-white linen bath set for personal hygiene Robe and slippers Towels set Personalized central air system Hair dryer Phone line Wi-Fi access All bathrooms are equipped with shower cabins with hydro-massage and music. All of our rooms have balconies with a great view of the city, where you can enjoy your breakfast or just some fresh air. Welcome in our luxury Apartments! Here you will find delicate European style , beautiful comfortable leather furniture, fine details and soft colors that will give you back the inner peace you been looking for. Our apartment is equipped with the following: Graceful glass Little table; LCD TV; DVD; Refrigerator; Air-conditioner; Double bed; Snow-white linen; Subjects of personal hygiene; individually controllable central air; Satellite TV All bathrooms are equipped with jakuzzi for 2 people, with several functions. Plenty of space and functional confort! We carefully designed our Suite rooms for the comfort of a family or up to 4 people. Smooth colors and sweet home atmosphere will brighten your day. It's 2 bedrooms with double beds, 2 shower cabins, 2 air-conditioners and 2 balconies with charming view over the city. Our Suite rooms are equipped with the following conveniences: TV satellite ( 500 channels ) DVD Mini-bar Air- conditioners Two double beds Snow-white linen Bath sets for personal hygiene Robe and slippers Towels sets Personalized central air system Hair dryers Phone line Wi-Fi access Two balconies, city view. Beds from 8 EURO !The most CENTRAL YOUTH HOSTEL of Chisinau. 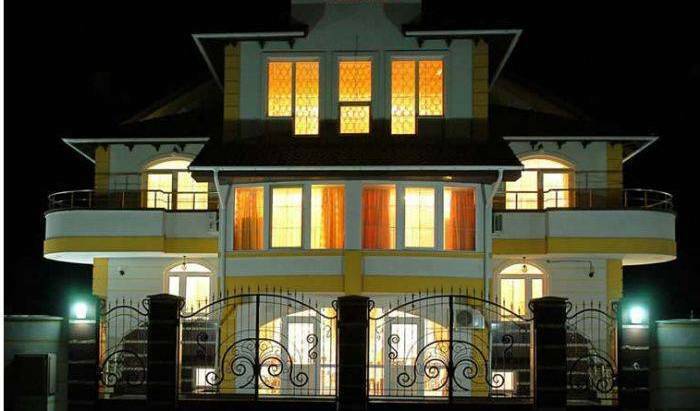 5 minutes walk from Presidential Palace and Main street ! The newest and the largest hostel of Chisinau and Moldova set up by experienced traveller 200 metres from fascinating park area called Valley of Roses. Welcome to the first designer WEEKEND BOUTIQUE HOTEL which is built by a unique style of architecture. WEEKEND BOUTIQUE HOTEL is welcoming tourists, businessmen and all those who come to visit the capital. The hotel has 22 comfortable rooms, single, double and triple. Each of them has TV, telephone, mini-bar, Wi-Fi internet and air conditioning. The automatic system ensures the hotel with heating and hot water. Very nice location at low prices with a quality staff! 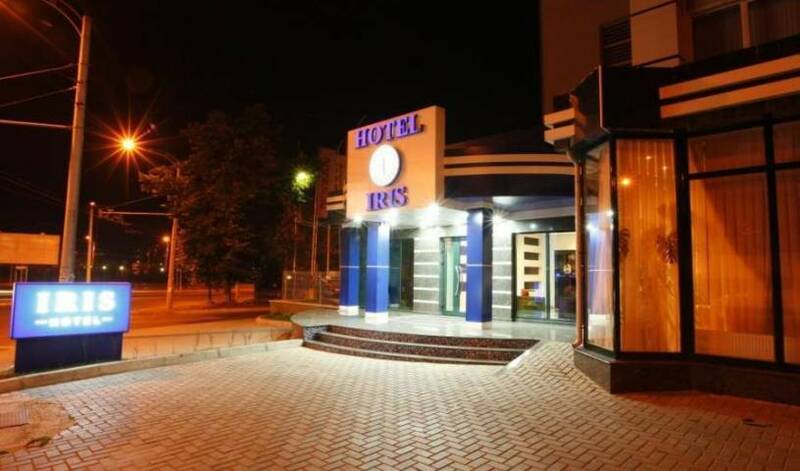 Located 5 minutes’ drive from Chisinau Botanical Garden, this hotel is 15 minutes’ drive from Chisinau centre. It features free Wi-Fi, an outdoor swimming pool and rooms with air conditioning. Accommodation at a low price in Iasi ! This room is mostly for woman, but if the hostel is full we allow man to stay in the room. Apartments are located in the heart of the city - in 2 minutes to the street Deribasovskaya. Private apartments with bathroom, fully equipped kitchen where guests can prepare their own meals. Free Wi Fi, private bathroom. Modern room can accommodate from 2 to 4 people. The room is very comfortable, has everything you need for a comfortable stay and a good rest: one or two double beds (queen size bed 160/200 cm) guest's choice, fridge, plasma TV, air conditioning, a bedside table, a desk, a wardrobe There is a shower cabin in a bathroom. Free WI-FI Internet and cable television. There are hair dryer, slippers, towels, cosmetic set in each room. It is new, modern hotel which has opened the doors in 2011. The hotel is located in the most important street of the city - Deribasovskaya. In this hotel is a small amount of rooms, that creates the atmosphere of comfort maximally approached to home. This room is designed in classic style, in vinous tones. General area of the room - 42м2, the height of the ceiling is a 4, 5 meter. There wonderfully view from the window at the comfortable, quiet Odessa’s backyard The thickness of building’s walls makes a 1, 5 meter, that creates an unique, natural microclimate in the room. At your disposal there are large double bed a 1. 8х2 meter, with the Swedish blankets and pillows from a natural fuzz, by the Italian bed from a natural cotton, double folding sofa with a sleeping place1. 8х2 m, arm-chair, toilet table, malachite bowls, TV with flat screen, cupboard, bronze chandelier. The room is decorated by the picture of the Dutch artists of the XVIII century and French tapestry of handwork. In a bathroom there is the large bath, hair dryer, dressing-gown, slippers and articles of the personal hygiene. The Junior Suite designed in classic style. General area of this room - 32м2, a height of ceiling is a 4, 5 meter. There wonderfully view from balconies at the Pushkin’s sycamores, museum of the East and Western arts is opened. The thickness of hotel’s walls are 1, 5 meters, that’s creates an unique, natural microclimate in the room. The room is executed in a coral’s tones. In the room there is a large double bed a 1. 8х2 meter, arm-chair, TV with a flat screen, cupboard, crystal chandelier and sconce, similarly the room is executed by the additional neon illuminating. The room decorates the wonderful couch for reading and daily rest. At your disposal double bed with the Swedish blankets and pillows from natural fuzz, by the Italian bed from a natural cotton. In a bathroom there is a whirlpool bath with illuminating, hair dryer, dressing-gown, slippers and articles of the personal hygiene. This room designed in classic style. General area of room 23м2, a ceiling height is a 4, 5 meters. There wonderfully view from the window at the Pushkin’s sycamores, museum of the East and Western arts is opens. The thickness of hotel’s walls are 1, 5 meters, that’s creates an unique, natural microclimate in the room. Superior room is executed in crayon tones, light, quiet gamut. In the room there is a large double bed 1. 8х2 meters, arm-chair, TV with flat screen, cupboard, crystal chandelier and sconce, the room is designed by the additional neon illuminating. This room is decorates the wonderful woven tapestry. At your disposal double bed with the Swedish blankets and pillows from natural fuzz, by the Italian bed from a natural cotton. In a bathroom there is a large shower cubicle 1. 1х1. 1 meter, hair dryer, dressing-gown, slippers and articles of the personal hygiene. This room designed in crayon, cream tones, in classic style. General area of the room - 40м2, the height of the ceiling is a 4, 5 meter. There wonderfully view from the terrace at the comfortable, quiet Odessa’s backyard. The guests of this room will be able to spend the wonderful evenings on a green terrace with a cup of fragrant coffee. The thickness of building walls is 1, 5 meter, that’s creates an unique, natural microclimate in the room. At your disposal large double bed a 1. 8х2 meter with the Swedish blankets and pillows from a natural fuzz, by the Italian bed from a natural cotton, arm-chair, TV with a flat screen and with the diagonal of a 41 inch, ancient buffet, dresser, cupboard, crystal chandelier and sconce. A number is decorated by the picture of the XVIII century. In a bathroom there is a large bath, hair dryer, dressing-gown, slippers and articles of the personal hygiene. This room designed in blue tones in baroque style. General area of the room - 40м2, height of ceiling is a 4, 5 meter. There wonderfully view from the terrace at the Pushkin’s sycamores, museum of the East and Western arts is opens. The guests of this room will be able to spend the wonderful evenings on a green terrace with a cup of fragrant coffee. The thickness of building walls is 1, 5 meter, that’s creates an unique, natural microclimate in the room. At your disposal the large double bed a 1. 8х2 m with the Swedish blankets and pillows from a natural fuzz, by the Italian bed from a natural cotton, with a baldachin, arm-chairs, TV with flat screen and diagonal a 41 inch(home cinema), mirror of the XVIII century, cupboard, crystal chandelier and sconce. The room is decorates by piano of the XVIII century. In a bathroom there is a large bath, hair dryer, dressing-gown, slippers and articles for the personal hygiene. Each of the comfortable double rooms of the “Grand Deluxe” category has a spacious bedroom / living room area of 22 sq. m and a well-equipped bathroom of 3 sq. m. The bathroom has all the necessary accessories and conveniences, including a hairdryer, a mirror, a set of towels, a cosmetic set, a bathrobe, slippers, etc. The rooms are furnished with king size beds with Italian bedspreads of soft colors, some rooms have two separate beds. 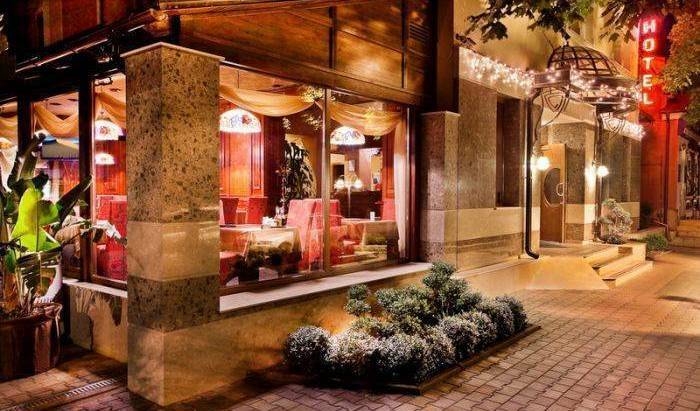 Superior rooms are located in a non-smoking area and have a balcony overlooking Old Odessa. The “Junior Suite” rooms are characterized by an increased area. Each double room of the “Junior Suite” category has a bedroom area of 23 sq. m and a bathroom of 3 sq. m. The bathroom has all the necessary accessories and conveniences, including a hairdryer, a mirror, a set of towels, a cosmetic set, a bathrobe, slippers with the logo of a comfortable hotel in the city center, etc. The rooms are furnished with King Size beds with Italian bedspreads of soft colors. All rooms of the “Junior Suite” have a panoramic view of the old Odessa. Luxury rooms vary considerably in size and layout from the rooms of other categories. The total area of the room is 39 sq. m. All rooms are equipped with exquisite modern furniture. At your disposal: a living room where you can relax, meet friends; Romance-bedroom, which will give you peace, harmony and coziness; Bathroom with area of 5sq. m. The bathroom has all the necessary accessories and amenities, including a hairdryer, a mirror, a set of towels, a cosmetic set, a bathrobe, slippers with a hotel logo, etc. The rooms are furnished with King Size beds with Italian soft-colored bedspreads. The room is 12 square meters with a single bed, bathroom and balcony. Room facilities: Individual climate control system Hypoallergenic pillows, blankets Plasma TV Telephone with international line Table Mini safe Mini bar Free Wi-Fi Electronic lock There is a set of towels, a bathrobe, slippers, a hairdryer, a set of Italian cosmetics in the bathroom . It is used modern detergents during cleaning. Plumbing is thoroughly disinfected.